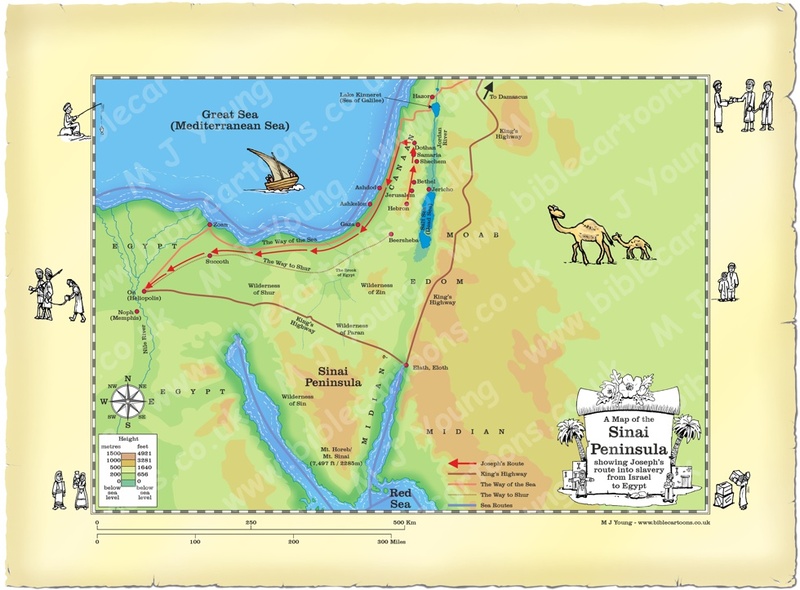 This is my map of the Sinai Peninsula, showing the route Joseph probably took when he was sold by his brothers into slavery and taken from Dothan in Israel to Egypt. Joseph started his journey from Hebron, where Jacob and his family lived (see Genesis 37:14 below). My map has red arrowed lines to show Joseph’s journey. After visiting Shechem and finding his brothers and their flocks had moved on, he went to Dothan, north of Shechem. It was near Dothan that Joseph’s brothers put him in a water cistern and eventually sold him into slavery. The red arrowed lines that represent Jospeh’s journey turns south from Dothan, as the Midianite traders took Joseph to Egypt. Although the route they took isn’t specified in the Bible, it is likely they used either or both of two Bronze Age trade routes (also indicated on my map): the Way of the Sea and/or the Way to Shur. In any case Joseph ended up in the city of On (aka Heliopolis), where he went to serve Potiphar (see Genesis 37:36 below). According to The Chronological Life Application Study Bible, Joseph was sold into slavery around 1898 B.C. If you look carefully at the map border you will see I have included some little black and white figures. I will add different figures to the borders of each map, adding characters that relate to the map subject. I have drawn a little picture of Joseph being sold to the Ishmaelites on the top right border and Joseph being walked off to Egypt on the middle left border. So when the Ishmaelites, who were Midianite traders, came by, Joseph’s brothers pulled him out of the cistern and sold him to them for twenty pieces of silver . And the traders took him to Egypt. Hebrew, 20 shekels, about 8 ounces or 228 grammes in weight. 36 Meanwhile, the Midianite traders  arrived in Egypt, where they sold Joseph to Potiphar, an officer of Pharaoh, the king of Egypt. Potiphar was captain of the palace guard. Hebrew, Medanites, a variant spelling of Midianites; compare 37:28.